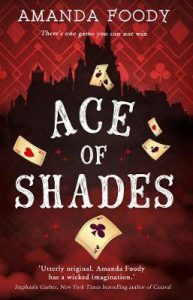 Ace of Shades by Amanda Foody was a delightfully twisty tale of murder, magic and mayhem and I couldn’t put it down! I feel like I’ve definitely found a new all-time favourite! This book is an ode to schemes and cons, full of street lords and mysteries and the addictive love of playing a game where the stakes are: win or die. You won’t be able to stop yourself falling in love with these characters or not accidentally toppling into the City of Sin to stay. It follows the journey of Enne Salta, who’s enter the City of Sin to find her missing mother. She’s a prim girl from a proper finishing school and tumbles head-first into this tumultuous world of casinos and street lords and backalley fights and the kind of magic where you can bet your soul in a card game and play to win or die. She meets a very young street lord named Levi Glaisyer, who’s in deep trouble from a con scheme gone wrong, and together their lives entwine as they look to find Enne’s mother and Levi hopes the reward payout will stop him dying. Except Levi’s enemies are tightening his noose fast, and despite his flashy smile and smooth card skills, they’re not playing around anymore. It mixes magic and con artists to perfection. I see a lot of comparisons with this to Six of Crows, and yes! It works! But also this isn’t a heist book. It’s about con schemes and card games. The world building was so detailed and exquisite, utterly flawless. It’s set in city with a 1920s vibe, so it’s all gangsters and casinos and grubby crime kids running around. But with MAGIC. Now it took me a while to get the hang of what the orbs/volts were, but I caught up. But everyone basically has talents, or two, and it’s just super cool how it’s a whole world of magicked people and how they use that. And how it affects everything. It’s impossible not to get caught up in the City of Sin and I couldn’t look away. Plus the writing is so visual and delicious that you can really see the whole thing. The characters totally stole the show too, with their fantastic and complex personalities, plus detailed and heart-wrenching character arcs. I’m absolutely smitten with both Levi and Enne. Usually with dual-narrating books I have a favourite: but not this time. They were both a fantastically stunning mix of conniving and softhearted sweethearts. Their stories entwine so beautifully, with them using each other but then needing each other…and then a longing for more sparking between them. The book’s set over 10 days and romance is definitely not the focus, and I really loved how their relationship played out. Levi was an absolutely precious masterpiece, a crime lord who’s gang is failing because he’s neck-deep in debt for a scheme he didn’t even want to run. He’s cursed to work for one of the biggest crime families, but what does he want? He wants to get to the top of his own game. He’s a card dealer and super smooth…but also absolutely adores his gang and is very loyal and sweet. Enne Salta was also a fantastic delight, and her character development just swept me off my feet. She starts off as a “proper lady” but quickly develops into someone who’s witty, ruthless, and quite cunning (while still being gloriously polite!) and basically, by a few chapters in, she was an accidental badass. I also just loved the writing and pacing. The writing just sweeps you up and the pacing of the book was also amazing, always luring you in deeper to the complicated plot that unwinds disasters for our favourite narrators. The plot is full of twists and turns, the foreshadowing is excellent, and it sets the scenes so well: murder card games, con schemes gone wrong, cabarets, magic and mayhem and murder, casinos and card games and gangsta hats and cherries and lush hotels and absolutely disastrous curses. 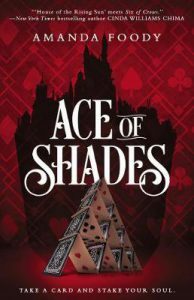 I can’t recommend Ace of Shades enough! It was everything I wanted and more, plus it included mountains of respectful and lovely diversity rep, and balanced characters you can’t help but fall in love with, plus a plot that will turn you inside out. High stakes. Magic. Wicked city schemes. Villains who never stop. And antiheroes leading the way. A fantastic adventure not to be missed!